Panel members: Dr Joshua Healy, Centre for Workplace Leadership; Dr Ruth Williams, Melbourne School of Population and Global Health; The Hon Dr Kay Patterson, Age Discrimination Commissioner; Kristine Gatt, Director of OH&S Worksafe Victoria, Dr Dan Woodman, School of Social and Political Sciences and Jenni Henderson from The Conversation. 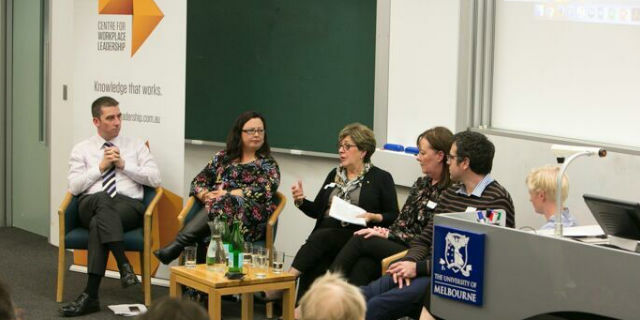 Researchers from the Centre for Workplace Leadership at the University of Melbourne, launched findings from a project titled, Attitudes to Ageing in Australia, on Tuesday 27th March. The event included a panel discussion consisting of the researchers Dr Josh Healy, Centre for Workplace Leadership, and Dr Ruth Williams, Melbourne School of Population and Global Health. However, there is evidence of certain types of ageist attitudes that are more prevalent than others – this predominantly centres around ideas of succession where there is a perception that older people should give up enviable resources, status and positions of power to make way for younger people. A short 7-minute video of the research was also launched on the night and can be viewed here. You can read more about the research in articles published in The Conversation and Pursuit.